Changes a GameObject's position over time to a supplied destination. Move To a transform position. Position the GameObject will animate to. If Transform Position is defined this is used as a local offset. Whether to animate in local or world space. 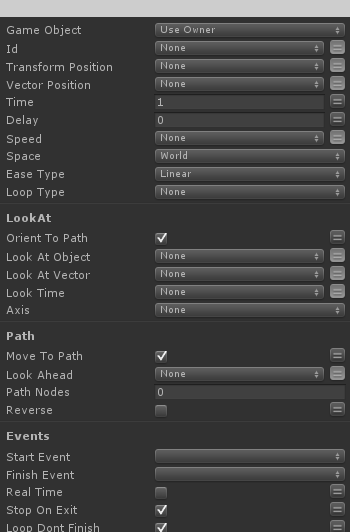 Whether to automatically generate a curve from the GameObject's current position to the beginning of the path. True by default. How much of a percentage (from 0 to 1) to look ahead on a path to influence how strict Orient To Path is and how much the object will anticipate each curve. A list of objects to draw a Catmull-Rom spline through for a curved animation path. A list of positions to draw a Catmull-Rom through for a curved animation path. If Transform is defined, this value is added as a local offset. Reverse the path so object moves from End to Start node.